THE EXPERIENCE YOU WANT & THE SERVICE YOU EXPECT! If there is one good investment you can make for you home, that’s installing a metal roof. This type of roof can last for as long as fifty years. Apart from that, with the correct tools, some assistance, a lot of patience, installing a metal roof can become a DIY project. 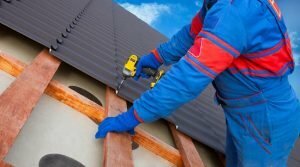 However, before you start, you have to know what mistakes to avoid when installing this kind of roof. Listed below are a few tips you have to keep in mind if you want to avoid a failed installation project. If you look at a metal roof carefully, you will see that the long ledges of the metal roof panels are not identical. A certain side has a lip that comes with a flange that extends another ½ inch, while another side but it does not have any flange. The edge of the roof panel that has a flange must be laid on the roof decks with the non flanged edge’s lip that overlaps the bottom lip. This is important, because the flange will prevent moisture from getting underneath the seam and then into the decking. Because most metal roofs North Myrtle Beach are going to be installed from the left and then to the right, this implies that the panel’s flanged edge would be placed to the right. Most amateur installers and shady roofing contractors make the mistake of driving the screws to the incorrect depth. The screws of the metal roof has a short sheet metal screw and a rubber washer that is found under the wide head of the screw. The washer is made to seal off the opening of the screw and create a seal that is watertight against the metal. In case the installer will drive the screw way too deep into the panel and then into the decking underneath, then the washer will be stretched as well as pushed outward and beyond the screw head’s edge. This will allow water to penetrate the washer’s inside edge where it meets the screw. Meanwhile, a screw that is not driven too deep will create a gap between the roof and the washer, which will allow water penetration. You have to drive the metal roof screws up until the screw head’s bottom will touch the washer that is located underneath and holds it in its proper position against the roof. A metal roofing must be installed in such a way that the panels’ edges are correctly positioned in relation to the eaves of the roof. In case the panels are cut way too short, there’s a risk that water could penetrate below the roof’s edge, especially during high winds and storm conditions. Meanwhile, panels that are way too long could let rain run off to overshoot your home’s gutters. Because of that, cut panels to a certain length where they will extend about two inches over the roof’s edge. Call NMB Roofing Pros if you are interested in installing a metal roof but want it to be done by professionals.